They’re a band! They’re a pin-up calendar! They’re a band and a pin-up calendar! 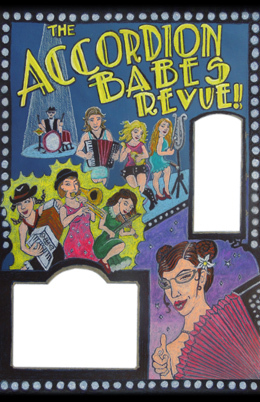 The Accordion Babes are Renée de la Prade on accordion and guitar, Joan Wilson Rueter on accordion and fiddle, Skyler Fell on accordion, Diana Strong on accordion, Amber Lee Baker on accordion and glockenspiel, and Aharon Wheels Bolsta, the odd man out, on drums. The show is more than accordions – though there are accordions galore – it’s a multitude of mult-talented, multi-instrument-playing musicians making merry on a magical mix of accordion-friendly songs – folk, French cabaret, jazz, klezmer, zydeco, Irish, and rock and roll. Renée began the revue and calendar project with the mission of taking the accordion from Lawrence Welk and giving it to Sophia Loren. This year’s theme is Heroes, Villains & Divas.